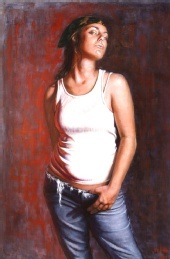 Sergio Rebia is an artist born and raised in California. He obtained his Bachelor's in Fine Art in 2004 and his Master's in Fine Art in 2008 from Laguna College of art and Design. He has exhibited in galleries steadily since 2004. Sergio prepares his work in a technique according to the tradition of the Old Masters of the 16th century in order to execute his realism. He mainly focuses on portraiture and figurative work, but within each painting he attempts to infuse beauty, dignity, and story behind the portrait. In other words, the painting is an homage to humanity. By using painting as a language Sergio attempts to send a message which he believes has the potential to communicate directly to a person's heart and soul without using a single word. I am mainly on this site to connect with possible clients as well as new, interesting and exotic models, especially female, who would be interested in posing for me and being elemental to my inspiration in creating a portrait painting. I work both from photograph and from life. I can't promise I will make you world famous, but I can promise that your image will become immortalized in a painting. I am open to portrait commissions and can discuss further details once you contact me.